Since John Greenleaf Whittier is such an important American writer, it is surprising that this book has long been out of print. We are proud to make it available to the public once again. 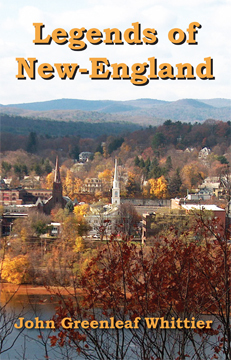 Legends of New-England was Whittier’s first book, published in 1831. It includes Whittier’s retelling of eighteen legends that were current in his time, some in prose and some in poetry. It is of interest because it is Whittier’s earliest work, because it lets us look at early American folk legends, and because the stories themselves are fascinating. It has some of the earliest tales of the supernatural in American literature, which compare with Poe’s and Hawthorne’s stories. John Greenleaf Whittier was one of the most beloved American poets. Every school child read his poems. People often quoted famous lines from his poems, such as "Blessings on thee, little man, Barefoot boy, with cheek of tan," and "‘Shoot, if you must, this old gray head, But spare your country’s flag,’ she said." Whittier was a Quaker and became an active abolitionist when he was in his twenties. He was the editor of two abolitionist newspapers, The Pennsylvania Freeman and The National Era, and was a founding member of the Liberty Party. He wrote two volumes of anti-slavery poetry. In 1866, just after slavery was abolished, Whittier published the book-length poem Snow-Bound, the best seller that established his reputation as a poet.